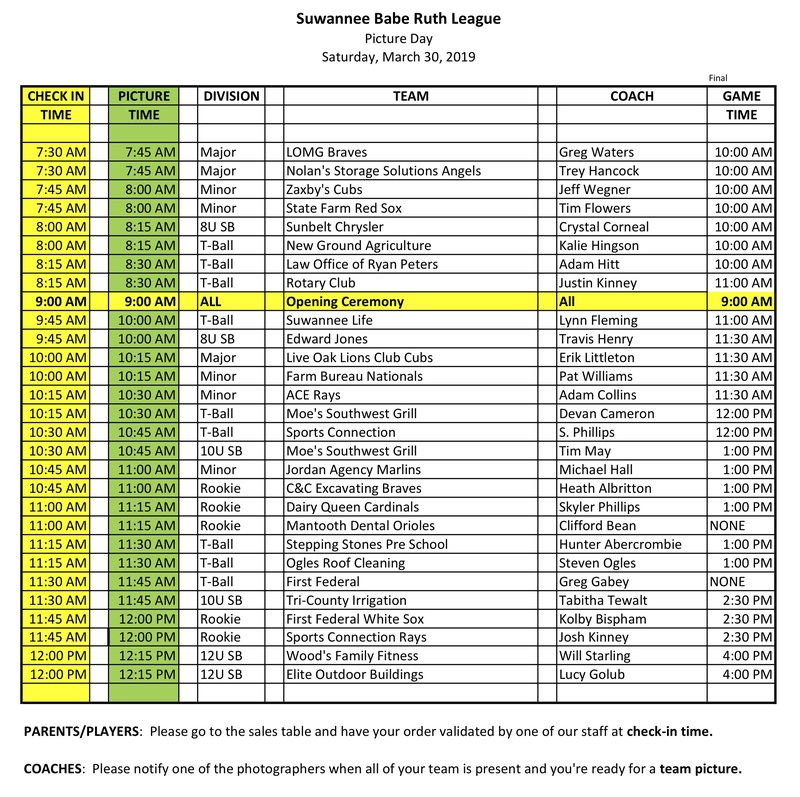 The Suwannee County Babe Ruth League offers children in our community the opportunity to participate in organized youth baseball in a safe environment. We seek to teach our participants the fundamentals of the game as well as instill a lifelong passion for baseball in each player. We strive to provide you and your child with a safe and enjoyable youth sports experience. If you have any questions or concerns regarding the Youth Baseball Program, please do not hesitate to contact us by phone at (386) 362-3004 or through email at suwanneerec@windstream.net. All participants will receive a uniform consisting of socks, pants, jersey and cap. Please do not practice in your team uniform. Uniforms will be distributed the week before the first game. Coaches will be provided with practice baseballs and a set of catcher’s gear for use during the season. All participants must furnish their own glove (write your player’s name on his glove in permanent marker) and cleats. Cleats must be made of rubber or plastic, no metal cleats allowed. We recommend that each player provide their own helmet, but we will provide additional helmets as necessary. Additionally, you must provide your player with a practice uniform (with a cap). All participants are encouraged to wear a protective cup, but any participant who will be playing catcher must wear a protective cup. Players can share bats, but most players choose to provide their own bat. See information on bat limitations below. NOTE: Senior League players are permitted to wear metal cleats. The Suwannee Parks & Recreation Tee Ball program is a coed, instructional league designed to introduce new players to the game and improve the skills of returning players. We do not keep an official score for Tee Ball games as the emphasis should not be on wins and losses but on player development and overall enjoyment of participation. Players must turn 5 years old before May 1st. Players cannot turn 7 years old before May 1st. There are no player evaluations for Tee Ball. Players will be assigned to a team by Suwannee Parks & Recreation staff. Siblings will be paired together. Location – All Tee Ball practices will be held in the outfields of fields 2, 3, 4 and 5 at the First Federal Sportsplex in Live Oak. Check the Tee Ball Field Map posted in the Concession Stand to help locate your practice field. Duration – Tee Ball teams will typically practice for an hour and a half no more than three days per week. Practices will be held on Mondays, Tuesdays and Thursdays typically beginning at 5:30 pm. Your coach will contact you with your official practice times. Location – All Tee Ball games will be held at the First Federal Sportsplex in Live Oak. Duration – Teams will play 10 games during the season, typically one weeknight game and one Saturday game each week. The season is scheduled to conclude prior to Memorial Day weekend, but may extend beyond that date depending on the final number of teams. All Tee Ball players will be outfitted with a uniform consisting of socks, pants, jersey and cap. Please do not practice in your team uniform. Uniforms will be distributed the week before your first game. Coaches will be provided with a batting tee and safety balls for use during the season. Additionally, all Tee Ball players will receive a personalized trophy at the conclusion of the season. Tee Ball participants must furnish their own practice uniform. Additionally, Tee Ball participants must provide their own glove and cleats (write your player’s name on their glove in permanent marker). Cleats must be made of plastic or rubber, no metal cleats allowed. We recommend each player have their own helmet, although we will provide helmets as needed. We also recommend each player have their own bat, but players can share bats amongst the team.